Jeff works 7 am – 3:30 pm. I watch Lily during the day and go in to work on the subway with Lily. 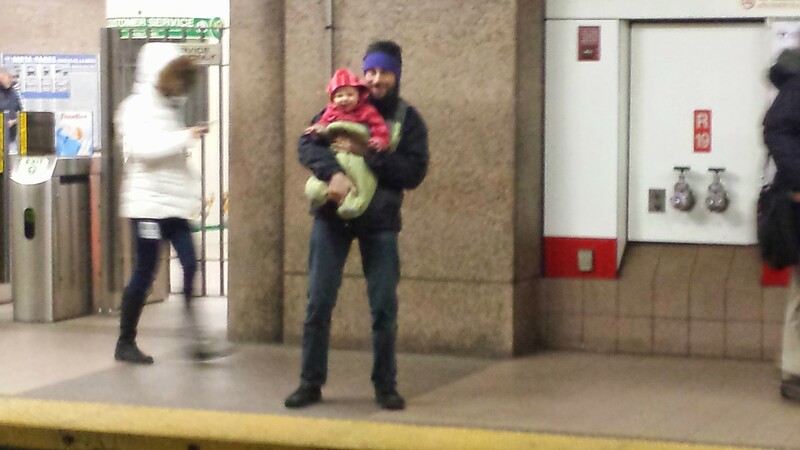 Jeff meets us at the subway station, gets on and rides several stops with us, and then gets off and goes back home with Lily. I work 4:30 – 9:30 pm. I also often work Saturday mornings. I have the same job as I used to do full time before having Lily, but per diem (meaning I’m scheduled and paid by the hour instead of having a salary). Each of us gets plenty of time with Lily, which we missed when she was in daycare. Lily is always with her parents, and in most ways I think we give better quality care than a daycare would. I certainly know more about child development now than when I was 19 and working in daycares. I like working half-time more than working full-time or caring for Lily full-time. Lily takes two naps, one while she’s with me and one while she’s with Jeff, so we each get some free time while she’s sleeping. We can get some housework and errands done while watching Lily. Most days Jeff and I only see each other for 15 minutes on the subway, with maybe a little time before or after work. This is big. On weeks when I work less than 25 hours, we bring in less money than if I were working full time and paying for daycare. Your numbers will vary depending on how much you earn and how much you pay for childcare. A very large proportion of our time is scheduled, so we often can’t do things that aren’t scheduled a month in advance (when I make my work schedule). I’m working during the times that a lot of social events happen, so I either miss things or decide to take a day off work to attend something in the evening. It also means if Jeff needs to do something during the evening and can’t bring Lily, I have to take a day off work. Assumes someone needs to watch your child 12 hours a day, 7 days a week. I’m counting naptime as half-free time, since you’re not actively watching the child but you can’t go anywhere. 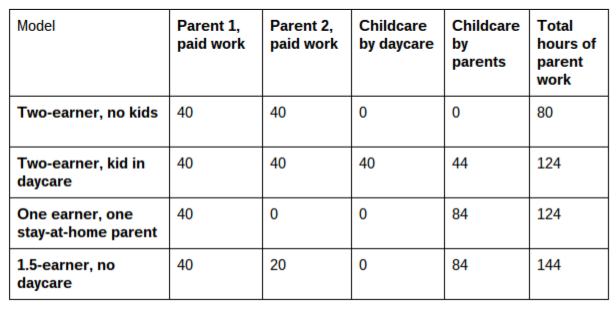 These numbers are somewhat misleading because working outside the home requires a commute, and taking the child to daycare requires additional commute time which I count as “childcare by parents” but is less fun than being home with the child. Many people enjoy working outside the home more than they enjoy watching their children, but I’m guessing almost no one enjoys commuting more than they enjoy watching their children. All of this only works for us because we have jobs that are flexible with hours. And because my commute passes by Jeff’s work. And because we have two parents. My brain hurts when I try to think about how much work single parents have to do. This entry was posted in Uncategorized and tagged children on May 28, 2015 by Julia. Your baby will grow and your needs and hers will change – the time goes by so fast and so slowly at the same time. When mine were younger, their dad and I had overlapping shifts – I worked 7 am to 3:30 pm and he worked 10 am to 6:30 pm. He dropped off, I picked up. Then they got into a great nursery school when they were 3 and 5, and after that school schedule dictated when and where they were. Best to all 3 of you!